In 1168, king Ferdinand II commissioned Master Mateo the termination of the works for the Cathedral of Compostela, including the construction of the final stages of the naves and the western closure of the Basilica. To do so, Master Mateo had to bridge the existing slope in the terrain, which he did by building the Portico’s Crypt, as well as the Stone Choir which occupied the first stages of the main nave. By combining French, Italian and Spanish influences he conceived the western closure of the Cathedral with a granite and painted portico which, due to its stylistic features, indicates the transition to Gothic art: the Portico of Glory, masterpiece of Spanish art of its period. According to their inscription, the lintels of the Portico were placed by Master Mateo on 1 April 1188. In the Portico an entire iconographic programme inspired on the Apocalypse was developed and which enlightened the worshippers who visited the Cathedral in a clear and understandable manner. 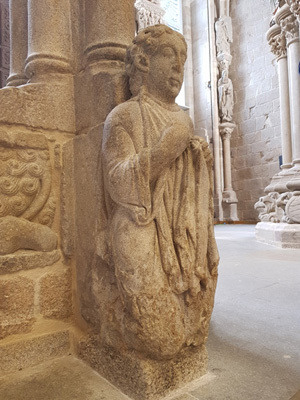 Between the years 1168 and 1211, Master Mateo developed an ambitious project in the Compostela cathedral that led to the construction of the Romanesque temple, beginning around 1075 and, at the same time, to its spatial and conceptual adaptation. The document granting a life pension for Ferdinand II of Galicia and León, dated February 23, 1168, and the inscription of the lintels of the Portico of Glory, dated April 1, 1188, where it is recorded that Mateo directed the work “from the foundations”, are the only two contemporary references that exist about a key figure in the History of Art that, nevertheless, maintains an enigmatic halo. Master Mateo has also been represented at the feet of the Portico of Glory, a portrait of humility, unprecedented in his time, that has been “canonized” popularly under the name of Santo dos Croques. Master Mateo completed the construction of the cathedral by its western closure, saving the slope in the land with the construction of an innovative crypt, on which stands the Portico of Glory, whose message is completed in the tribune. Originally, the Portico was opened by an exterior façade, which shared the iconographic program of the ensemble and which was modified in the sixteenth century in order to place doors to close the temple, which was until then permanently open; finally, in the mid-eighteenth century, this façade was replaced by the current one, Baroque, leaving the Portico incomplete and enclosed behind it. Mateo’s project also included the construction of a stone choir, which occupied the first sections of the central nave and gave continuity to the iconographic program of the Portico. This choir was demolished in 1604 and replaced by a wooden one, that has also been removed from its original location. Likewise, the workshop directed by Mateo was in charge of the sculpture of Saint James at the high altar -now very modified- thus defining a longitudinal west-east axis in the temple, with two seated sculptures of Saint James the Great at each end. Everything was completed on April 21, 1211, when the solemn consecration of the Cathedral of Santiago took place. In the Portico of Glory, Master Mateo developed a complex iconographic program of apocalyptic and salvific content focused on the vision of the celestial Jerusalem, completing the history of the salvation of Man initiated on the side covers of the Romanesque cathedral. The message begins in the crypt of the Portico, where the earthly world is represented, which needs the stars to be illuminated -in the keystones of the vaults-, unlike the new Jerusalem, whose light is the Lamb -in the keystone of the tribune-. The Portico is settled on a series of animals, real and fantastic, of the medieval bestiary, each with its own meaning; they would represent the symbols of evil oppressed by the Glory of God. The lateral arches lack a tympanum. In the left arch, beside its complex interpretation, the representation of the People of Israel can be seen in the upper archivolt, abided by the Mosaic law while, in the lower one, the descent of Christ into Limbo is represented. The Final Judgment is represented in the right arch, with the heads of Christ and Saint Michael in the keystone, separating the blessed, who are led to Glory, from the damned, who are placed under torment. The Glory of the central tympanum is presided by an image of Christ in Majesty, surrounded by the four evangelists and the group of the blessed. The angels with instruments of the Passion are represented in the lower part, and, in the archivolt, twenty-four elders tune their instruments to play celestial music. The tympanum is supported by the lintels, with the commemorative inscription of its placement in 1188, and the seated image of Saint James the Great in the top of the column with the tree of Jesse dominating a mullion with the Tree of Jesse, the human genealogy of Christ that is completed with the divine one in the capital of the Trinity. A series of column statues are distributed on the sides, with prophets to the left and apostles to the right, which continue in the counter façade and, also, in the former exterior façade, from which different pieces are preserved. The individualization of the faces of the characters of the Portico of Glory as well as their complicity constitute one of the main contributions of the Master Mateo to the History of Art. 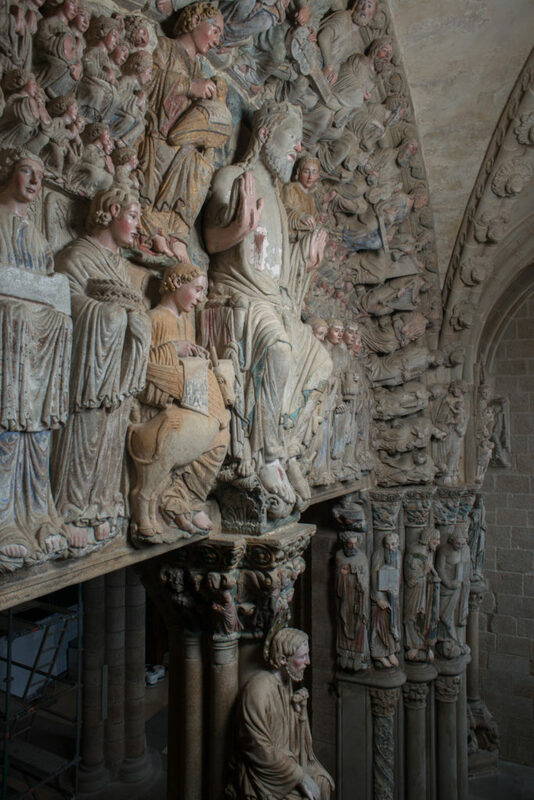 Between 2008 and 2018, the Portico of Glory underwent a deep and complex restoration, sponsored by the Fundación Barrié. After a phase of previous studies on the state of conservation and causes of the deterioration of the work, some interventions on the ensemble were carried out, focusing, mainly, on two aspects: prevention of damp filtrations and condensation in the Portico of Glory and recovery of the original polychrome that was preserved under dust and dirt. 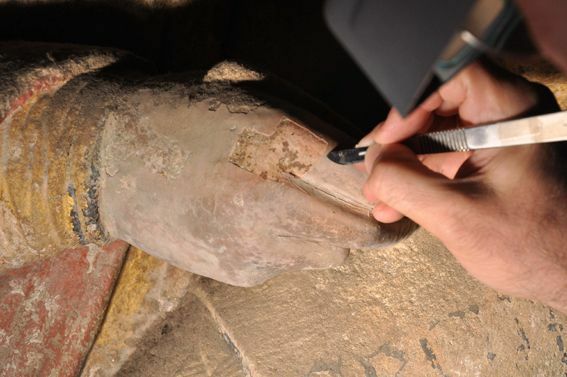 In this way, a masterpiece of medieval art has been recovered, as well as part of its splendor, as shown from the remains of up to three layers of complete polychrome and other partial repainting works, carried out from the original painting applied by the Master Mateo’s workshop to the Baroque period. The delicate nature of his work requires the application of preventive conservation measures that can prevent further deterioration of the Portico of Glory, which is why it is necessary to maintain stable conditions of humidity and temperature, as well as to limit the number of people who can be, at the same time, within the area of the ensemble. The Museo Catedral de Santiago organizes guided tours to the Portico of Glory. Access by Pazo de Xelmírez.